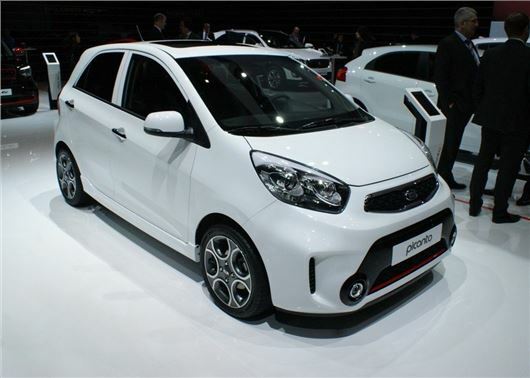 Kia has unveil its updated Picanto at the Geneva Motor Show. The revised model gets refreshed exterior styling, new equipment options and a new range of efficient engines. Arriving in April 2015, the updated Picanto will cost in the region of £8000. The Picanto’s mid-life facelift includes a number of exterior updates, with new front and rear bumpers, along with a revised front grille. Inside, chrome accents have been added to the instrument cluster and air vents, while the centre console gets a cleaner and easier to use fascia. Kia has also improved the seat upholstery, with new patterns and styling. The 1.0-litre petrol engine range has almost been updated to bring it into line with Euro6 standards, which should improve economy, although Kia hasn’t released any official economy figures. Along with the model updates, the Picanto will be offered with a raft of new options, which include seven-inch screen navigation, cruise control and three new interior colour packs - Red, Yellow or Brown - which add artificial leather seats, door trims and footwell illumination. The Picanto will also be offered with 10mm larger brakes, allowing the car to stop from 60mph in 37 meters - an improvement of two meters. No 106 BHP 1.0 turbo? Disappointing - maybe that new engine is just for overseas markets? Hope Kia do offer a turbo 1.0 engine. We have a 2011 kia pic 1.0 ltr and its pocket rocket, so we cant wait for the turbo version.